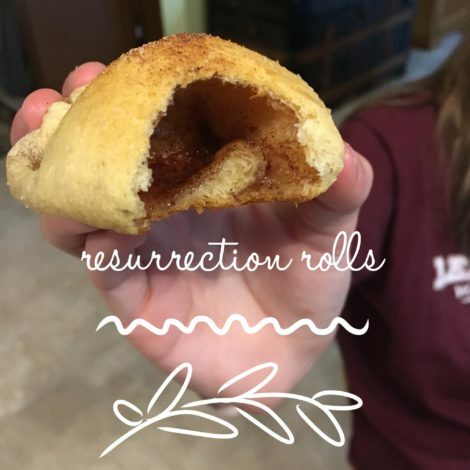 This morning, I made Resurrection Rolls with my kids! I found this idea from our Easter blog post, in the bottom BONUS section – we like to call “Truth to Inhale”. This activity was a huge success and I’m so happy we did it! The ingredients are simple (and you may already have in your kitchen)🙌: crescent rolls, butter, marshmallows, sugar, and cinnamon. It’s perfect for ANY age, which is nice and rare for me — my kids are preschool through middle school age. 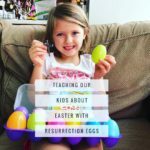 The best part was at the very end, while my kids were happily eating, I had a rare moment of their full and undivided attention while we read the actual Easter story from Luke 24.📖 While they ate, they asked some pretty deep questions that surprised me! 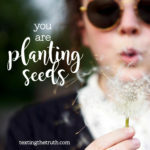 We looked in scripture to find the answers together (like where was Jesus on the second day? Why couldn’t they recognize him at first? Why did he eat fish? )🤔 Good questions! 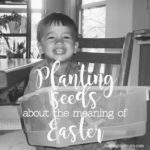 Did you do this Easter activity or another one with your kids lately? We’d love to hear about it!